With each passing day, we get closer to the shift in the tide that will sweep away this self-serving delusion of the ruling elites like a crumbling sand castle. Those living in revolutionary times are rarely aware of the tumult ahead: in 1766, a mere decade before the Declaration of Independence, virtually no one was calling for American independence. Indeed, in 1771, a mere 5 years before the rebellion was declared, the voices promoting independence were few and far between. Recall that news could only travel as fast as a ship between seaports or a horse on the colonies' minimalist roads, and it took days to travel between Boston, Philadelphia and New York, and much longer to reach Williamsburg and Charleston and points west. Communications were slow and limited, and this makes the rapid change of the political tide even more extraordinary. Are we in a pre-revolutionary era? Here's clue #1: politics has failed. When the political process can no longer fix what's broken, politics has failed. When entire classes of citizenry no longer feel represented, politics has failed. When the system delivers a steadily declining standard of living to the bottom 80% of households, politics has failed. Clue #2: having failed, the political machinery passed the baton to the central bank, which attempted to fix what's broken by creating money out of thin air. "Free" money and low-cost credit has always been viewed as the go-to fix for whatever's broken, because it's, well, free to the issuing central state and politically popular (everybody loves free money, free bread and free circuses). This political expediency works for a time--hence it's popularity throughout history-- but eventually the asymmetries, perverse incentives and unintended consequences pile up and the entire financial system capsizes. Clue #3: America's monetary substitute for political process has failed. The failure isn't visible to those paid not to look at centralized failure, but it's visible to objective observers. 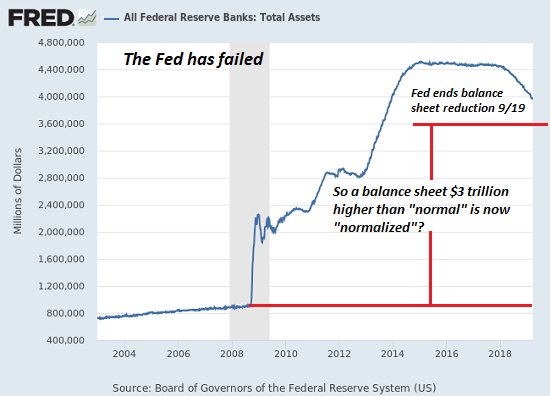 Glance at the chart below: the Federal Reserve has announced it will end reducing its "emergency response to save the world" balance sheet in September 2019, leaving it roughly $3 trillion larger than it was a decade ago in the pre-crisis definition of "normal." This exceedingly modest reduction has been called "normalization," and so the end of "normalization" means we're back to normal, right? Calling the extraordinarily abnormal balance sheet "normal" doesn't magically render it normal. The magic trick of substituting monetary policy for the political process has failed. Creating credit and currency out of thin air is not a substitute for the loss of representation, soaring inequality, the dominance of parasitic elites or for responding to the changing realities of finance, economics, demographics or resources. Central banks only have a few levers, and when they lower interest rates and buy assets, they're only temporarily propping up a failing system: they've fixed nothing. Huge swaths of the populace are still unrepresented; parasitic elites still dominate the financial and political systems; wealth and income inequality has been greatly accelerated; the majority of people are still losing ground and their wealth/income are increasingly precarious. Revolutions are manifestations of dynamics that have been festering beneath the surface for decades. Those benefiting from a failing status quo--the top 5% that dominate finance, government, the media, think tanks, philanthro-capitalist foundations, higher education and the national defense/healthcare cartels--all reckon that since the system works great for me, it works great for everyone. Thank you, William S. ($100), for your outrageously generous contribution to this site -- I am greatly honored by your steadfast support and readership. Thank you, Robert J. ($50), for your splendidly generous contribution to this site -- I am greatly honored by your steadfast support and readership.